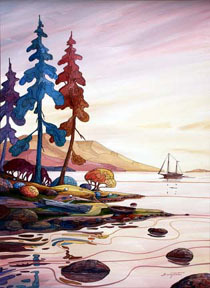 Barry was born in Victoria, BC, Canada, and he has lived near the ocean throughout his life. 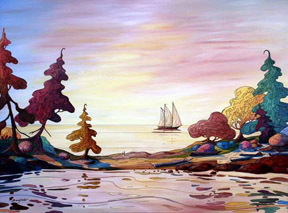 Noted for his unique interpretive style and bold use of color, Barry's paintings of coastal scenery reflect his passion for life and the sea. His work has been collected in over 51 countries around the world and in every state of the USA. 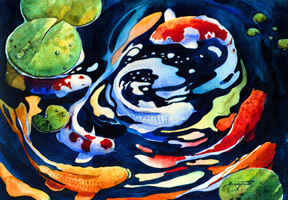 The large brightly colored Koi fish found in many ponds around Hawaii are also popular subjects. Barry belongs to a number of Koi associations and has had two Koi shows in England. "I think Koi are one of nature's perfect art forms. I love their rich vibrant colors and how they move with Zen like grace." Barry's admiration and first hand experience explains why his paintings feel so alive and why they've been collected by first time buyers to the president of the Koi Association of England. Barry has enjoyed a long and successful interest in the visual arts beginning with the sale of an oil painting and sculpture at age 15. 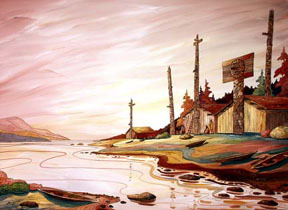 In 1995 he decided to pursue a full time art career which has rocketed skyward ever since. Today, almost half of his work goes to international destinations. Barry conducts a variety of workshops at a local university and enjoys public speaking. He has been the guest artist on a variety of venues from cruise ships to Koi conventions, and plans a painting-on-location trip each year at selected galleries. 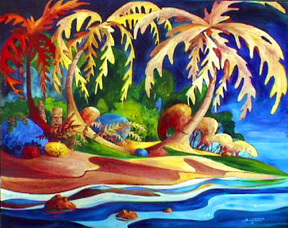 He currently alternates part of his year working from his studio on Piers Island near Victoria, and on Maui in Hawaiiâ��his other "most favorite" island.